The Red Door Program at St. Mary of Mercy, which began during the Great Depression, provides a bagged lunch, Monday through Saturday to more than 150 persons each day. The program is underwritten by St. Mary of Mercy Church through various contributions made directly to the Red Door. To volunteer or for more information, please contact one of the coordinators at 412-261-0110 ext. 314. First Lutheran Church has a team of Walk-in Ministry volunteers that serve in daytime walk in ministry hours once every five weeks. They talk with guests about their needs and offer friendly support and encouragement for the challenges they face. They have the possibility of offer emergency food from their small food pantries, local bus tickets for appointments, and referral suggestions for a wide variety of non-profit and government agency services. 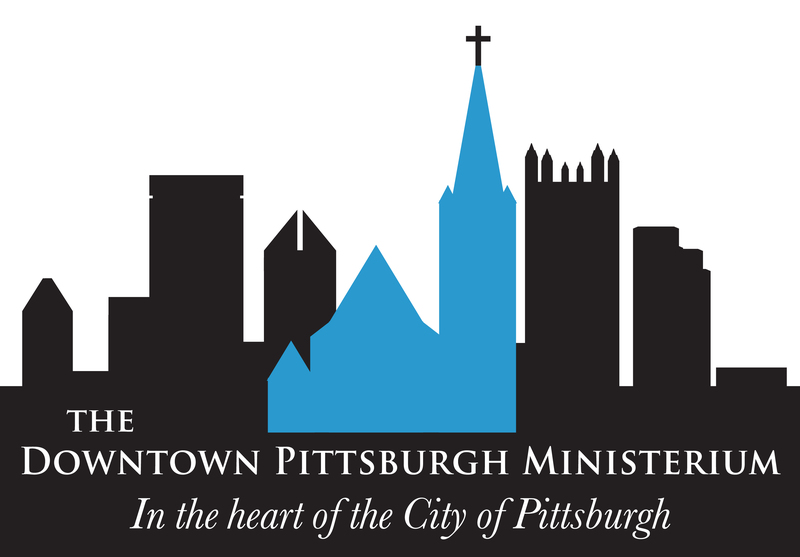 For more information, they can contact First Lutheran’s Pastor Jennifer McCurry at jpm@flcpittsburgh.org or 412-471-8125. Trinity Cathedral has a team of Walk-in Ministry volunteers that serve in daytime walk in ministry hours once every five weeks. They talk with guests about their needs and offer friendly support and encouragement for the challenges they face. They have the possibility of offer emergency food from their small food pantries, local bus tickets for appointments, and referral suggestions for a wide variety of non-profit and government agency services. For more information, they can contact Trinity’s Marianne Novy at mnovy@pitt.edu. Outreached Arms takes place every Tuesday night in the basement of the First Presbyterian Church. We feed 100 to 150 people each Tuesday night. So, if you are interested in volunteer, you will sign your group up on the Pittsburgh Cares website . Your group will then arrive at the Oliver Avenue entrance (320 Oliver Ave) at 5:30/5:45pm to run through the tasks and volunteer necessities for that evening and a prayer session. Then, we open the doors at 6:00pm and dinner is served at 7:00pm. We clean up and finish up with the night around 8:30pm. Volunteers can help with the cooking, set-up, serving of food and drinks, clean up and building relationships and talking to our guests. Outreached Arms is a wonderful program and we would love to have anyone join who is interested! The Cellar meets every Monday, Tuesday, and Thursday from 3:30-6:00pm. The Cellar opens its doors to our city’s high school students, offering them a place to hang out, grab a snack, and share what’s important to them. If you have a heart for teenagers and would like to find out how you can help out at The Cellar, contact April at ahart@yfcmp.org or Katie at kpeffer@fpcp.org. First Presbyterian Church also has a team of Walk-In Ministry volunteers that serve in daytime walk in ministry hours once every five weeks. When FPCP is the “church of the week” we serve a hot lunch all five days and on Fridays we have fresh produce. They talk with guests about their needs and offer friendly support and encouragement for the challenges they face. They have the possibility of offer emergency food from their small food pantries, local bus tickets for appointments, and referral suggestions for a wide variety of non-profit and government agency services. For more information, they can contact Louise McManus at lmcmanus@fpcp.org. Groups that volunteer on Sunday evenings provide and serve the evening meal for Shepherd’s Heart congregation, about 175-225 people. Those in your group who are not preparing the meal will be able to sit in the service and worship with the poor and homeless. Please contact the Shepherd’s Heart church office at 412-281-1305 or shepheart@verizon.net to reserve a date for your church/group to volunteer. Volunteers assist the staff with whatever the needs are on a given day. Volunteers may help by serving breakfast and coffee, by providing towels and toiletries for those needing showers, or by helping with laundry. There is also prayer each morning in the drop-in center. If you are interested in volunteering, please contact the Shepherd’s Heart church office at 412-281-1305 or shepheart@verizon.net. Become a mentor for ex-offenders in the HOPE Aftercare Mentoring Program. If you’re interested in volunteering your time, please complete and submit our Volunteer Application. Volunteers must be at least 21 years of age, willing to attend necessary training, and able to pass a background check. Chaplaincy volunteers must also be officially endorsed by a faith community.